1. Cut a 10" section of Cotton Webbing and Ribbon of your choosing. 2. 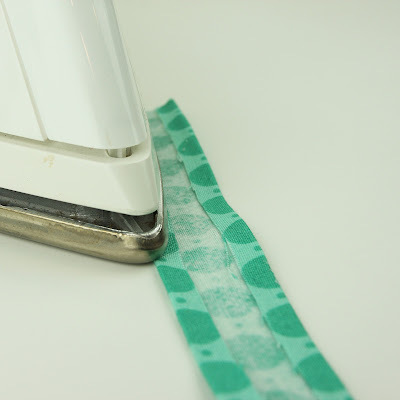 Iron Heat N Bond (10" by thinner than ribbon) to Cotton Webbing making sure to center it, this is not a necessary step but it makes it easier to sew the Ribbon on especially with embroidered ribbon. 3. Iron the Ribbon to the Cotton Webbing. 4. Now sew up one side of the Ribbon and down the other. The Ribbon is attached securely to the Cotton Webbing now. Trim the edges so that they are even. 5. Fold the Cotton Webbing in half, right sides facing out and match up the ends. Stitch the ends together with a 1/4" seam allowance. Trim any loose threads. 6. Tuck the sewn seam ends into the Key Fob Hardware, making sure that the Cotton Webbing is in there evenly and not hanging out one end or the other. 7. 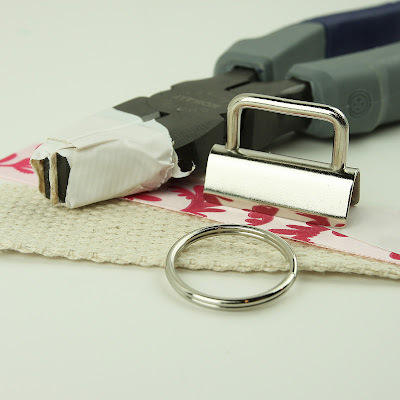 Using your Pliers wrapped in duct tape or a scrap of fabric to protect the metal from getting scratched, squeeze the Key Fob Hardware closed a little at a time. I like to go back and forth a couple of times so that I don't over crimp one side too much. 8. Add the Key Ring and Yay!!! You are done. Good Job!!! 1. Cut a 10" section of Cotton Webbing and Fabric strip, create a 10"x1.25" strip of Fabric and a 10"x0.75" strip of Heat N Bond. 2. Center and Iron Heat N Bond to the wrong side of Fabric strip. 3. Remove backing and on each side fold 1/4" seam over and iron. 4. Turn finished Fabric Strip right side up and iron to Cotton Webbing making sure to center it. 5. 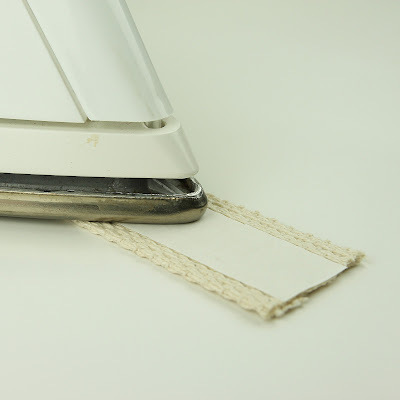 Stitch along the edge of your Fabric strip, securing the edge onto the webbing. Work slowly, keeping close to the edge. Go the whole length and around the ends of the fabric strip for added stability. 6. Fold the Cotton Webbing in half, right sides facing out and match up the ends. Stitch the ends together with a 1/4" seam allowance. Trim any loose threads. 7. Tuck the sewn seam ends into the Key Fob Hardware, making sure that the Cotton Webbing is in there evenly and not hanging out one end or the other. 8. 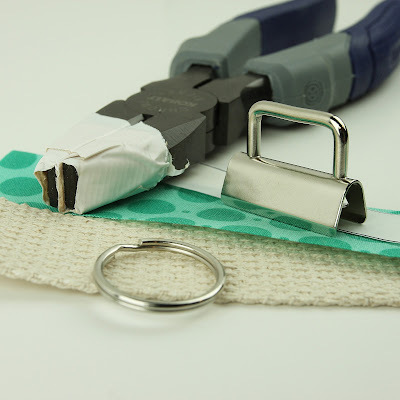 Using your pliers wrapped in duct tape or a scrap of fabric to protect the metal from getting scratched, squeeze the Key Fob Hardware closed a little at a time. I like to go back and forth a couple times so that I don't over crimp one side too much. 9. Add the Key Ring and Yay!!! You are done. Good Job!!! 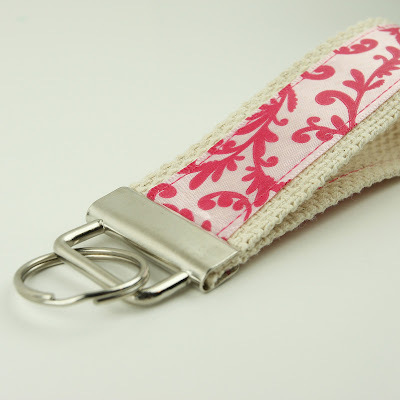 Gift idea #3: Key Fob Hardware Wristlets are a great useful and personal gift to give. Key Fob Hardware is simple to use and produces amazing results. 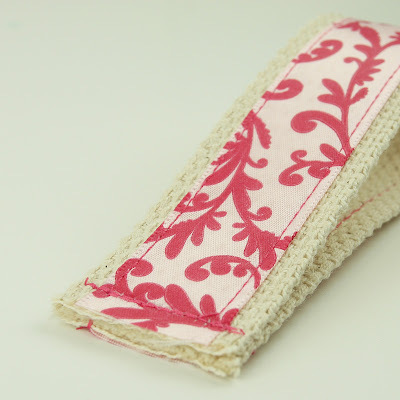 Just add your fabric, ribbon, webbing, or embroidery for an instant, elegant wristlet. Check it out! Today we are running a Giveaway for a Key Fob Hardware Starter Kit and Pliers!!! 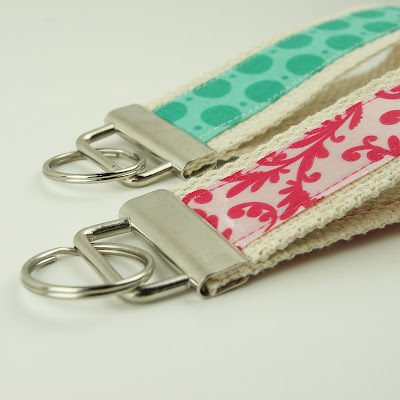 Key Fob Wristlets are a fast and fun go to gifts! *(For a total of 30 Key Fob Hardware Sets and Pliers). Key Fob Hardware are functional and attractive. They can be made into Tags, Wristlets, Wristlet Purses, Wristlet Smart Phone Case or whatever your imagination can think of. Using our Key Fob Hardware that are as little as .27 cents a piece, you can create one of a kind, personalized creations to gift or sell for $5 to $6 dollars at a craft shows and bazaars. Giveaway is open until Monday, November 6, 2016. 1. LIKE & SHARE this Giveaway, then COMMENT and share with us your favorite thing about Fall. - Ours is getting to curl up in front of a fireplace together. I Like Big Buttons! - May The 4th Be With You Giveaway is still going on!!! 4 Prizes and 4 Winners!!! Here at I Like Big Buttons! we are HUGE Star Wars fans. In celebration of that fun fact, we are running a super Star Wars giveaway to celebrate May the 4th. We will be giving away four (4) prizes, that means we will have four (4) lucky winners**! Details Below. 1. LIKE & SHARE this Giveaway, then COMMENT and share with us your favorite Star Wars character. In our house, there are too many to count. At the moment, I favor Princess Leia. She had the best hairdos and still managed to give the Empire what for. Who doesn't like a strong female lead :). *If your name is drawn as the winner, we will check to make sure you have completed all 3 requirements above. **Names will be drawn randomly with our Rafflecopter App. The first name drawn will receive the 1st prize, the second name drawn the 2nd prize, and so on. Today we are running a Giveaway for a Key Fob Hardware Starter Kit and Pliers!!! Key Fob Hardware are functional and attractive. They can be made into Tags, Wristlets, Wristlet Purses, Wristlet Smart Phone Case or whatever your imagination can think of. Using our Key Fob Hardware that are as little as .27 cents a piece, you can create one of a kind, personalized creations to gift or sell for $5 to $6 dollars at a craft shows and bazaars. Giveaway is open until Monday, December 12, 2016. 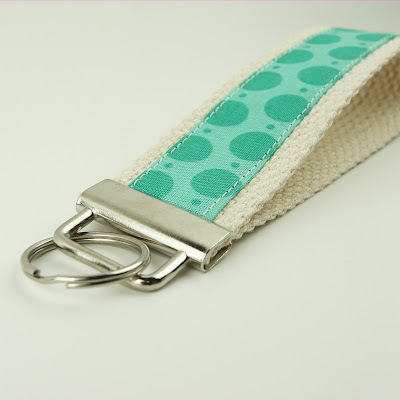 Today, I am making a Fabric Key Fob Hardware Wristlets. While we wait for our Key Fob Starter Kit Giveaway to end (Monday, 10/31/16), I decided to make a few adorable Key Fob Wristlets to show just how easy and fun they are to make. 1. Cut a 10" x 5" section of Fabric of your choosing and 10" x 2.5" Fusible Fleece. 2. Iron Fusible Fleece to the center of the fabric. Fold and iron the Fabric in half with the wrong sides together. 3. Unfold and iron the Fabric in half again long sides to the center. 4. It will look like this when you get done. 5. 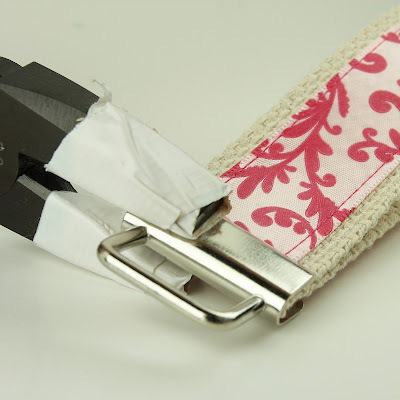 Use your Sewing Clips to pin the Wristlet flat. 6. Stitch along the edge of your Fabric strip, I stitched 1/4" in. Remove the Sewing Clips as you go. Work slowly, keeping close to the edge and as straight of a line as possible. 7. Repeat 1/4" stitching along the opposing edge. 8. 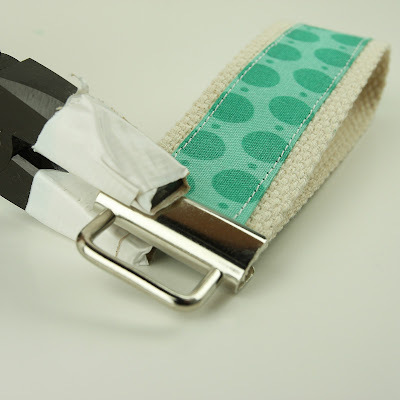 Fold the Fabric Wristlet Strip in half, right sides facing out and match up the ends. 9. Stitch the ends together with a zig zag stitch. I went back and forth a few times to insure it held. 10. Trim any loose threads. 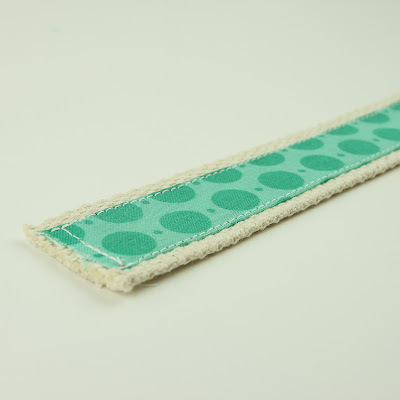 Use Fray Check to seal the end of the exposed Fabric edge. 11. 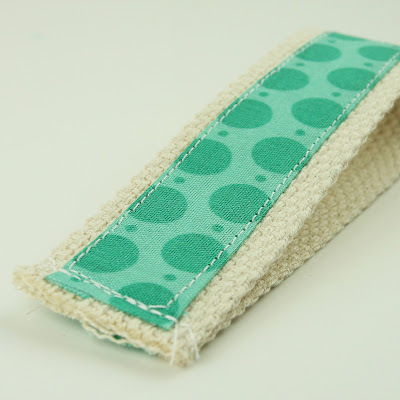 Tuck the sewn seam ends into the Key Fob Hardware, making sure that the Fabric Wristlet is centered. 12. Using Key Fob Hardware Pliers squeeze the Key Fob Hardware closed with gentle pressure. Sometimes, I go back and forth from left to right added a little bit of pressure to each side until it eases together. Our Key Fob Hardware Pliers make this easy to do. 13. Note the adjustable screw set to the distance I want the pliers to go to. 14. Add the Split Ring and Yay!!! 15. I love them and now I have a few new sets to share!!! Key Fob Hardware are functional and attractive. They can be made into Tags, Wristlets, Wristlet Purses, Wristlet Smart Phone Case or whatever your imagination can think of. Using our Key Fob Hardware that are as little as .27 cents a piece, you can create one of a kind, personalized creations to gift or sell for $5 to $6 dollars at a craft shows and bazaars. Giveaway is open until Monday, October 31, 2016.
Who needs some more Gunmetal craft items? Well, I do. Brand New! 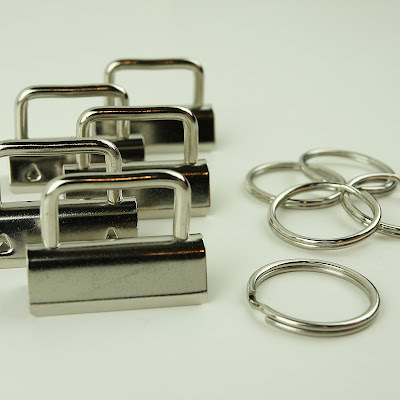 Gunmetal Key Fob Hardware with Split Rings are now available here in 1" and 1.25". We also carry the classic Silver and Antique Brass Key Fob Hardware too. Shop here. Gift idea #5: Key Fob Hardware Wristlets are a great useful and personal gift to give. Key Fob Hardware is simple to use and produces amazing results. 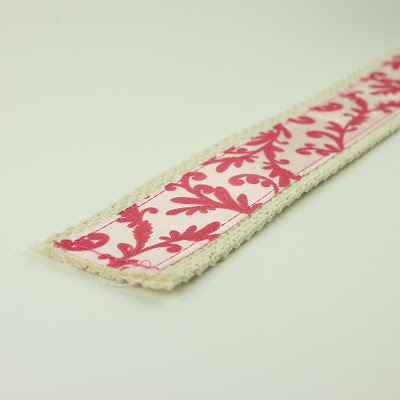 Just add your fabric, ribbon, webbing, or embroidery for an instant, elegant wristlet. Check it out! Today will not be known as the Monday before Thanksgiving. It will be known as Black Friday, but still on a Monday!!! :P I couldn't resist. :) My kids would be so proud. You will receive 10 sets of 1” Key Fob Hardware in Silver and Antique Brass Finish, 10 sets of 1.25” Key Fob Hardware in Silver and Antique Brass Finish, and a set of Key Fob Hardware Pliers (for a total of 40 Key Fob Hardware Sets and pliers). Key Fob Hardware are functional and attractive. They can be made into Tags, Wristlets, Wristlet Purses, Wristlet Smart Phone Case or whatever your imagination can think of. Using our Key Fob Hardware that are as little as .27 cents a piece, you can create one of a kind, personalized creations to gift or sell for $5 to $6 dollars at a craft shows and bazaars. Giveaway is open until Monday, September 7th. How to remove a plastic snap (stud side) with KAM Snap Removal Pliers. 1. With the die die installed, locate the broken snap. 2. Turn snap cap side up with stud facing down. 3. Place broken snap in pliers, stud face down. The stud will settle in the raised dome in die. 4. Apply firm pressure to the snap with the KAM Snap Removal Pliers. You will hear a pop when the snap has broken. 5. This is what the cap and stud will look like once they have been broken. 6. Tada! It is that easy!!! How to remove a plastic snap (socket side) with KAM Snap Removal Pliers. 1. With the socket die installed, locate the broken snap. 2. Turn snap cap side up with socket facing down. 3. Place broken snap in pliers, socket face down. The socket will settle over the raised dome in die. 5. This is what the cap and socket will look like once they have been broken. Introducing, our brand new KAM Snap Removal Pliers. They are great for removing broken snaps or incorrectly installed plastic snaps. If you need to remove a plastic snap, this is by far the easiest means for removing it. If you would prefer to remove a snap with tools you may already have, we do have videos on how to do that here. 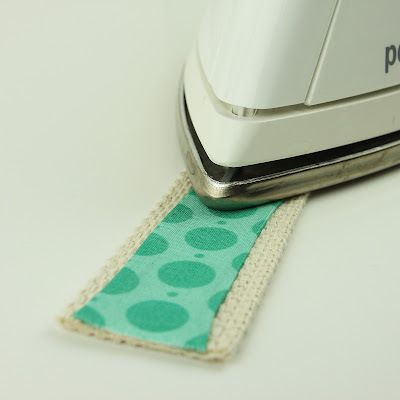 See how easy it is is with one of our step by step tutorials, coming soon! 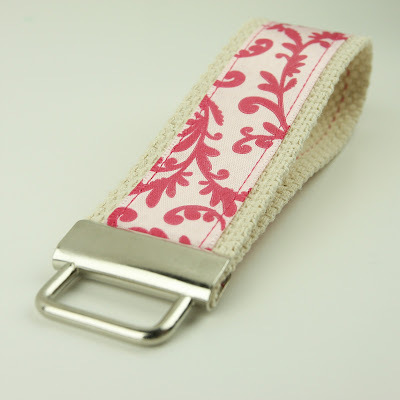 Today, I am making embroidered ribbon Key Fob Hardware Wristlets. Just a couple weeks ago, my mom, sister and I had a girl's weekend at my home. In between long rounds of talking and catching up (we talk every week by phone ;), eating good food, chasing kids, and being put to work. They graciously volunteered to help me do some of the tedious day to day work for my business. 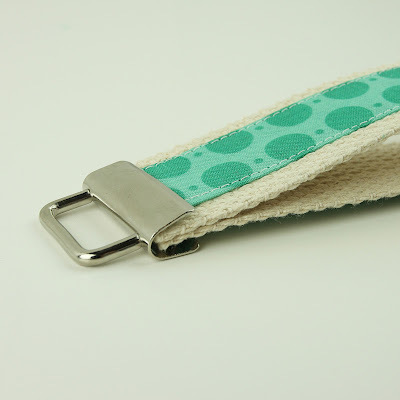 We snuck in some time to make a few Key Fob Hardware Wristlets for them. Here are some examples of how they turned out. 1. Cut a 10" section of the Cotton Webbing and Ribbon of your choosing. If you would like (I didn't do it this time but have in the past): Cut a 10" section of Heat N Bond, keeping it thinner than your ribbon. 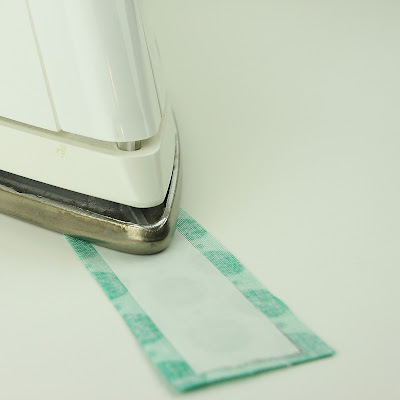 Iron the Heat N Bond to your Cotton Webbing, making sure to center it. 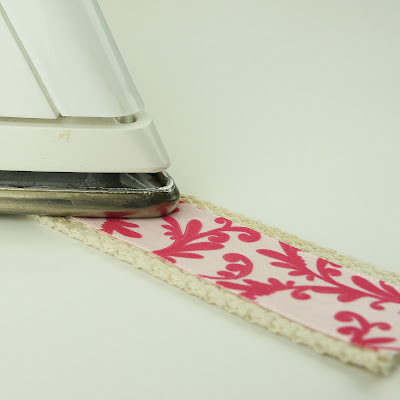 This is not a necessary step but it makes it easier to sew the Ribbon on especially with embroidered ribbon. Iron the Ribbon to the Cotton Webbing. 3. Using my Standard Sewing Machine with Embroidery options, I picked the word I wanted on my ribbon and sewed it on my ribbon. I folded my ribbon in half and estimated about where the letters would end up and came up with about 2 1/2" to 3" down to get the font centered on the Wristlet once finished. 4. Use Fray Check to seal the end of the Cotton Webbing. 5. I laid out my Ribbon and Rick Rack how I wanted it to look using my Wonder Clips. Love them! 6. Sew up one side of the Ribbon and down the other. The Ribbon should now be securely attached to the Cotton Webbing. 7. Fold the Cotton Webbing in half, right sides facing out and match up the ends. 8. Stitch the ends together with a 1/4" seam allowance. 9. Trim any loose threads. 10. Tuck the sewn seam ends into the Key Fob Hardware, making sure that the Cotton Webbing is centered. 11. Using Key Fob Hardware Pliers squeeze the Key Fob Hardware closed with gentle pressure. 12. Note the adjustable screw set to the distance I want the pliers to go to. 13. Add the Split Ring and Yay!!! 14. I love them and now I have a set for myself too!